In the present work the effect of heat treatment processes at different temperatures and in different quenching media on mechanical properties in addition to corrosion behavior in different pH solutions of aluminum alloy 6061 was achieved. The alloy was received as fabricated and the solution heat treatment processes was achieved at temperatures (490,530,570 °C), then quenching for every degree was done in two media (water, oil) to obtain on six samples. The artificial aging was done on every sample at temperature (160°C) for one hour. The microstructure was examined to show Mg2Si in every sample. The results of hardness test showed that the hardness of alloy increased with increasing heat treatment temperatures, and at the same temperature the quenched specimens in oil had higher hardness. On the other hand, the tension tests showed that the strength of alloy increased with increasing of heat treatment temperature, and at the same temperature the quenched specimens in water had higher hardness. The results of corrosions test showed that the heat treatment operations improved corrosion resistance, and the lower value was get upon treating at 530°C. في هذا البحث تمت دراسة تأثير عمليات المعالجة الحرارية عند درجات حرارة وفي أوساط سقاية مختلفة على الخصائص الميكانيكية وسلوك التآكل في أوساط مائية ملحية مختلفة بدرجة الحموضة PH لسبيكة الألمنيوم 6061. تم إحضار السبيكة كما تم تشكيلها وتم إجراء عمليات المعالجة الحرارية المحلولية عند درجات حرارة (490,530,570°C ), وأجريت السقاية عند كل درجة في وسطين مختلفين (الماء, الزيت) للحصول على ستة نماذج. تم التحقق من البنية المجهرية لكل نموذج وتوزع سيليسيدات المغنزيوم ضمن كل نموذج. أظهرت نتائج اختبارات القساوة أن السبيكة تزداد قساوتها مع ازدياد درجة حرارة المعالجة الحرارية, وعند نفس الدرجة أبدت العينات المسقاة بالزيت قساوة أعلى. أما نتائج اختبار الشد أظهرت أن السبيكة تزداد متانتها مع ازدياد درجة حرارة المعالجة الحرارية, لكن العينات المسقاة بالماء عند نفس الدرجة كان لها المتانة الأعلى. أظهرت نتائج اختبارات التآكل أن العينة المعالجة عند 530°C والمسقاة بالماء تبدي أقل معدل للتآكل في وسط مائي ملحي حمضي, بينما العينة المعالجة عند 530°C والمسقاة بالزيت تبدي أقل معدل للتآكل في وسط مائي ملحي معتدل, أما في الوسط المائي الملحي القلوي فالعينة المعالجة عند 570°C والمسقاة بالماء تملك أقل معدل تآكل. Aluminum Alloys --- Corrosion --- Heat treatment. Sheet metal forming becomes a research topic for its widely using in the industrial field, these researches seeking for a better specifications of the products with low cost of production processes using available raw materials. In this work the sheet metal used is CuZn35 1mm thick. This sheet metal formed by a process named hydroforming process using a square shaped die to form the sheet metal according to its cavity by the pressure of the hydraulic which must be in direct contact with the surface of the sheet metal. Tests had been made for this sheet metal and for the final product for the as received specimen and for the heat treated one which shows the improvement of the formability of this sheet metal. يعتبر مجال بحوث تشكيل الصفائح المعدنيه من المجالات الواسعة و اصبحت محط أنظار الباحثين و مادة ثريه للبحوث العديدة لما لها من استخدامات واسعة من الصناعة و الحياه العمليه ،ان هذه البحوث تهدف للحصول على مواصفات أفضل و كلف انتاج اقل باستخدام خامات معدنيه متوفره في هذه الدراسه ان الصفيحة المستخدمه هي (سبيكة البراصCuZn35 ) بسمك ا مليمتر . تم تشكيل هذة الصفيحة بطريقة التشكيل الهيدروليك باستخدام قالب ذو مقطع مربع حيث تم سحب الصفيحة لتجويف القالب بواسطة ضغط الهيدوليك حيث يكون تلامس مباشر بين الهيدروليك و سطح الصفيحة . تم اجراء العديد من الفحوصات للصفيحة المعدنيه و للمنتوج الاخير للسبيكة المستلمه بدون مكعالجات حراريه و كذلك للسبيكة المعالجة حرارياً و التي أظهرت تحسناً و اضحاً لقابلية التشكيل . A theoretical and experimental investigation pertaining to the buckling behavior of slender fiber reinforced polymer columns subjected to axial loading under varying temperatures (from room temperature to 50℃). Two groups of composite materials were used for manufacturing of test specimens, the first consist of perlon fiber as a reinforcement and acrylic resin as a bonding matrix, while the second consists of a combination of perlon and carbon fibers as reinforcement. The composite specimens were fabricated by vacuum molding technique and cut according to ASTM D-638 for conducting tensile test. The data from tensile test were used to calculate the effective slenderness ratio and defining the column as Euler buckling column. An experimental rig was designed, manufactured and calibrated to study the effect of thermal and buckling load subjected to columns. Numerical analyses pertaining the buckling behavior for both groups were conducted. The results show that the temperature has a considerable effect on properties of fiber reinforced polymer composites where the value of critical load and Young's Modules decrease with the increase of temperature for both groups. Perlon & Carbon reinforcement composites gave best mechanical properties, which make them the best candidate to improve the buckling resistance characteristics of composite materials. يتناول البحث تحقيق نظري و تجريبي سلوك الانبعاج لأعمدة المصنوعه من الموادالبوليمريه المقوى بالألياف التي تخضع لحمل محوري في درجات حرارة متفاوتة (درجة حرارة الغرفة إلى 50 درجة مئوية). مجموعتان من المواد المركبة تم استخدامهما لإنتاج عينات الاختبار، الاولى تتكون من الياف البرلون كماده تقويه و(acrylic resin)كماده اساس رابطه بينما المجموعه الثانيه تتالف من الياف البرلون والكاربون كماده تقويه. تم تصنيع عينات الاختبار بواسطة تقنية ( (vacuum modelingوقطعت وفقا ل((ASTM D-638 لإجراء اختبار الشد. البيانات من اختبار الشد تم استخدامها لحساب نسبة النحول. في هذه الدراسة، تم تصميم جهازتجريبي خاص وتصنيعه ثم معايرته لغرض دراسة تأثير الحمل الحراري والانبعاج على الاعمده كما تم اجراءتحليل عددي يتناول سلوك الانبعاج لكلتا المجموعتين. أظهرت النتائج أن درجة الحرارة لها تأثير كبير على الخصائص مختلفة للمواد المركبه البوليمريه المقواه بالالياف حيث ان قيمة الحمل الحرج ومعامل المرونه تتناقص مع ارتفاع درجة الحرارة لكلا النوعين من المجموعات المركبة. المواد المركبه (مع الياف البرلون والكربون كماده تقويه) أظهرت خصائص ميكانيكيه افضلَ، التي تَجْعلُهم أفضل مرشّحِ لتَحسين خصائصِ مقاومةِ الانبعاج للموادِ المركّبه. Buckling --- Temperature --- Composite Materials --- Carbon and Perlon fibers --- الانبعاج --- الحراره --- المواد المركبه --- الياف الكاربون والبرلون. Electrospinning is a simple and highly versatile method for generating ultrathin fibers (mainly polymers) with diameters ranging from a few micrometres to tens of nanometres. This technique has attracted tremendous recent interest in both academia and industry, owing to its unique ability to produce ultrafine fibers of different materials in various fibrous assemblies. Electrospinning is a process that uses an electric potential to overcome the surface tension of a solution to produce an ultra-fine jet, which elongates, thins and solidifies as it travels through the electric field to a collector.. In this research, we studied the effect of conditions of the cabin “specifically humidity” on the diameter of nanofibers manufactured by electrospinning. We used Polyvinyl alcohol (PVA) polymeric solution with weight concentration of 10%, voltage 20 kv, under different values of relative humidity. Fiber morphology and fiber diameter were determined using scanning electron microscope, and measuring the fiber diameter by using image j program. It was found that the diameter of the fibers increased with increasing the relative humidity within our studying area .تعتبر عملية الغزل الكهربائي عملية سهلة و بسيطة لإنتاج ألياف نانوية بأقطار تتراوح بين بضعة ميكرومترات و عشرات النانو مترات. وقد لاقت هذه الطريقة اهتماماً كبيراً مؤخراً في المجالات الأكاديمية و الصناعية, وذلك بسبب قدرتها على إنتاج ألياف متناهية في الصغر من مواد مختلفة وبأشكال مختلفة. يتم في هذه التقنية استخدام تيار كهربائي عالي الجهد يتغلب على التوتر السطحي للمذيب فيتشكل تيار بثق عالي الدقة, ويستطيل ثم يتصلب أثناء انتقاله إلى مجمع مأرض أو مشحون عكسياً. تم في هذا البحث دراسة تأثير شروط الحجرة وتحديداً الرطوبة على قطر الألياف النانوية الناتجة عن عملية الغزل الكهربائي حيث تم استخدام محلول بوليميري من ال PVA بتركيز وزني 10 % , و فرق كمون 20 kV و تم تطبيق قيمة مختلفة للرطوبة النسبية. تم تحديد شكل و قطر الألياف الناتجة باستخدام المجهر الالكتروني و قياس أقطار الألياف الناتجة باستخدام برنامج Image j, و تم ملاحظة تزايد القطر مع زيادة نسبة الرطوبة وذلك ضمن المجال المدروس. Nanofibers --- Electrospinning --- Nanotechnology --- process conditions --- Relative Humidity --- الألياف النانوية --- الغزل الكهربائي --- تقانة النانو --- شروط العملية --- الرطوبة النسبية. In the present work the worn journal bearing is simulated to discuss the effect of adding TiO2 nanoparticles to the base oil on its thermal performance. An extensive numerical investigation is carried out to study the effect of different parameters affecting thermal performance of worn journal bearing such as the eccentricity ratio (ε), the wear depth parameter (δ), and the nanoparticle concentration (Φ). The computational approach is provided by using finite difference method for solving the governing equations, namely, the modified Reynolds equation, energy and heat conduction equations with suitable equation to include the variation of the oil film thickness due to the bearing wear in order to estimate the benefits of using nanolubricant in worn journal bearings. Oil viscosity dependence on nanoparticle concentrations is considered by using Krieger Dougherty model. The mathematical model as well as the computer program prepared to solve the governing equations were validated by comparing the oil film pressure distribution obtained in the present work for a worn journal bearing with that obtained numerically by Hashimoto et.al (1986) with 3% maximum deviation between the results. The maximum oil film pressure obtained in this work was compared with that obtained experimentally by Roy  (2009) for intact journal bearing with 3% as a maximum error between the results. The results obtained show that the nanoparticles addition by 0.5% and 1% to the base oil increases the load carrying capacity of the worn journal bearing by 20% and 40% respectively while decreases the oil side leakage by 5% and 10% and friction coefficient by 2.75% and 5.7% as compared to that lubricated with pure oil. This is happen with the expense of power losses. 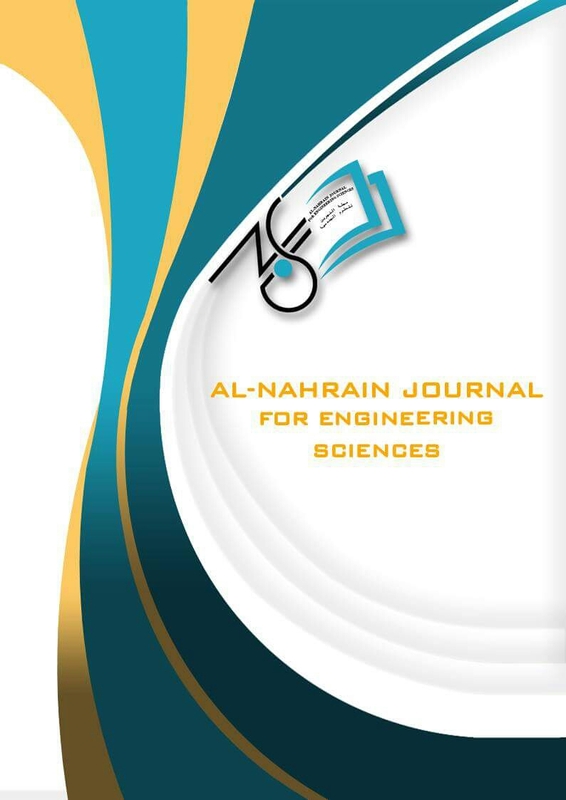 Calculations also shows that adding a higher percentage of nanoparticles (2%) has a harmful effect on the performance of a worn journal bearing since the power losses is highly increased.تم في هذا البحث تمثيل المسند المقعدي المتاكل لمناقشة تاثير اضافة دقائق نانوية من مادة ثاني اوكسيد التيتانيوم (TiO2 ( الى الزيت الاساس على الاداء الحراري لتلك المساند.تم اجراء دراسة موسعة لتاثير العوامل المؤثرة على الاداء الحراري للمساند المقعدية المتاكلة مثل نسبة اللاتمركز(ε(و معامل التاكل (δ) ونسبة المواد النانوية المضافة الى الزيت الاساس (Φ) . تم اجراء التحليل العددي للمسالة باعتماد طريقة الفروقات المحددة لحل المعادلات الحاكمة للمسالة والمتمثلة بمعادلة رينولدز المعدلة ومعادلة الطاقة ومعادلة انتقال الحرارة بالتوصيل الحراري بالاضافة الى معادلة سمك طبقة الزيت المحورة لتاخذ بنظر الاعتبار تاثير تاكل المسند عليها وذلك لدراسة الفوائد من استعمال الدقائق النانوية الى الزيت الاساس على اداء تلك المساند. تم اعتماد النموذج الرياضي العائد للباحث (Krieger- Dougherty) لتوصيف اعتماد لزوجة الزيت على نسبة المواد النانوية المضافة. تم التحقق من صحة النموذج الرياضي علاوة على البرنامج الحاسوبي الذي اعد لغرض حل المعادلات الحاكمة عن طريق مقارنة بعض النتائج المستحصلة في هذا البحث مع النتائج العددية المنشورة من قبل الباحث Hashimoto(1986) بالنسبة للمساند المتاكلة والنتائج العملية المنشورة من قبل الباحث Roy(2009) . تم احتساب الانحراف في النتائج الكمستحصلة في البحث الخالي وتلك المنشورة من قبل الباحثين المذكورين اعلاه ووجدت لاتتجاوز 3%. اظهرت النتائج المستحصلة في هذا البحث ان اضافة مانسبته 0.5% و 1% من المادة النانوية الى الزيت الاساس ادت الى زيادة قابلية المسند لتخمل الاخمال بنسبة 20% و 40% على التوالي بينما انخفضت كمية التسرب الجانبي للزيت بنسبة 2.75 و5.7% بالمقارتة مع المساند المقعدية المزيتة بزيوت غير حاوية على اضافات . اظهرت النتائج ايضا بان اضافة المادة النانوية بنسب قد تصل الى 2% الى الزيت الاساس له تاثير ضار على اداء المساند المقعدية المتاكلة حيث ازدادت قيمة الطاقة المستهلكة بشكل كبير. The present work demonstrates the optimization process of Micro- hole of Electrical Discharge Machining (EDM) by Adaptive Neuro Fuzzy Inference System (ANFIS). The workpiece material was copper alloy. The current, gap distance and pulse on time were the control parameters of EDM. The process has been successfully modeled using ANFIS model constructs a fuzzy inference system in MATLAB 7.2 Software Gaussian type for optimization of micro diameter, were adopted during the training and testing process of ANFIS model in order to compare the prediction accuracy of micro diameter by one membership function. Finally, the comparison of ANFIS results with experimental data indicates that adoption of Gaussian membership function in proposed system achieved satisfactory accuracy. Prediction using ANFIS model compared with experimental values of micro holes at correspond ratio 98.37%. هذا العمل يدل على الطريقة المثلى لقطع الثقوب الدقيقة بالشرارة الكهربائية بواسطة استخدام نظام التكيف العصبي غامض الاستدلال. المادة المشغلة كانت سبيكة من النحاس. التيار، مسافة الفجوة وزمن استمرار النبضة هي عوامل سيطرة للقطع بالشرارة الكهربائية. هذه الطريقة أثبتت نجاح استخدام نموذج نظام التكيف العصبي غامض الاستدلال باستخدام برنامج الماتلاب 7.2 نوع غاوسي للحصول على الأقطار المثلى، اعتمدت أثناء عملية التدريب واختبار نموذج نظام التكيف العصبي غامض الاستدلال من أجل مقارنة دقة التنبؤ للأقطار الدقيقة دالة عضوية واحدة. وأخيراً، مقارنة النتائج لنظام التكيف العصبي غامض الاستدلال مع البيانات التجريبية تشير إلى أن اعتماد وظيفة غاوسي العضوية في النظام المقترح تحقق دقة مرضية. التنبأ باستخدام نموذج نظام التكيف العصبي غامض الاستدلال بالمقارنة مع القيم العملية للثقوب المايكروية عند نسبة تطابق 98.37%. Applying conjunctive use between surface water and ground water is getting widely used at many regions in the world, due to the increasing need of water resources, especially when large quantities of water and for long time are used for irrigation purposes to meet agricultural production requirements. The linear programming has been formulated to optimize the optimum allocation of water. An economic analysis of conjunctive use for Al-Wand project in Iraq has been done for a certain cropping pattern using two scenarios of management and operation of ground water and surface water. One suggested scenario was to use ground tank to save the water during the period of water excess to be used during the shortage period. The other scenario was to operate the reservoir dam to supply the water requirements during the agriculture years. The main concerns of this research were: the fluctuation of the ground water and how to estimate the deficit of yield which is caused by using the decreased water in irrigation. The economic analysis has been done by calculating the overall cost and the annual estimation of return. It can be concluded that the operation of surface water at (60 and 70%) from total available surface is a compromise, because some of the water still flow in the river and canals and the ground water reservoirs were not affected especially its storage capacity. استخدام الربط الامثل بين المياه الجوفية والسطحية اصبح اكثر انتشاراً في مناطق عديدة من العالم نتيجة لزيادة الحاجة الى الموارد المائية وخصوصاً عند استخدام كميات كبيرة من المياه ولفترة طويلة لغرض توفير الاحتياجات المائية للانتاج الزراعي. البرمجة الخطية استخدمت للحصول على افضل تخصيص مائي للربط بين المياه السطحية والجوفية لمشروع نهر الوند في العراق الذي حدد بدورة زراعية وذلك من خلال استخدام اسلوبين في ادارة وتشغيل مصادر المياه السطحية والجوفية. احد الاساليب المقترحة هو انشاء خزانات ارضية لحفظ المياه من المصادر الجوفية للاوقات التي تتوفر فيها المياه والتي تزيد عن الحاجة وفي اوقات عدم الحاجة الى تلك المصادر واستخدامها في اوقات العجز المائي. الاسلوب الاخر المقترح هو تشغيل سد الوند لغرض توفير الاحتياجات المائية وخلال سنة زراعية. من اهم الاعتبارات التي استخدمت في هذا البحث هو تذبذب مناسيب المياه الجوفية ، والنقص في الانتاج صيغ نتيجة لاستخدام النقص المائي في الارواء . التحليل الاقتصادي نفذ من خلال تقدير الكلف الكلية والعائد الكلي لسنة زراعية ومن خلال النتائج التي تم الحصول عليها. من ذلك نستنتج ان تشغيل الماء السطحي بنسبة (70-60%) من مجموع الماء السطحي المتوفر يعتبر حل وسط ولان كمية المياه تبقى في الانهار والقنوات والذي لا يؤثر على سعة الخزين الجوفي. water requirement --- conjunctive use --- linear optimization --- recharge of ground water --- الاحتياجات المائية، الربط الامثل بين المياه السطحية والجوفية، البرمجة الخطية، تغذية المياه الجوفية. In this paper, the design of a robust controller for two wheeled inverted pendulum (TWIP) system is presented. In the first stage of the design, a full state feedback H_2 control is designed for stabilizing the inclination of (TWIP) system to upright position. The 〖 H〗_∞ controller for the stabilized system is synthesized in the second stage. The mathematical model of the system based on the Newtonian approach is developed. The results verify that the proposed controller can compensate the system parameter uncertainty with a more desirable time response specifications.في هذا البحث، تم تصميم مسيطر رصين لنظام بندول مقلوب ذي عجلتين. في المرحلة الاولى تم تصميم مسيطر ذو تغذية رجعية لكل متغيرات النظام باستخدام طريقة ال H_2 من اجل استقرارية ميل نظام البندول المقلوب عن الوضع العمودي. في المرحلة الثانية تم تصميم مسيطر ال H_∞ للنظام المستقر. تم اعتماد النموذج الرياضي للنظام والممثل بطريقة نيوتن. النتائج تبين ان المسيطر المقترح بامكانة تعويض التغييرات التي تحدث في معاملات النظام وبمواصفات استجابة زمنية مرغوب فيها. Two wheeled inverted pendulum --- H_2 full state feedback control --- H_∞ controller --- Robust control --- Optimal control --- بندول مقلوب ذي عجلتين ، مسيطر H_2 ، مسيطر H_∞ ،سيطرة رصينة ،سيطرة مثلى. The aim of this study is to evaluate the sediment transport and to assess the quality of water for a reach of Euphrates River with a length of (124.4 km), begins from downstream of Haditha dam which represents the upstream of study, and ends at Heet station in Heet city which represents the downstream. There are 196 cross-sections which were distributed along the study area by using the model of one-dimensional HEC-RAS version 4.1. Calibration and Verification processes from(01-Sep-2013) to (30-Nov2013) and (01-DEC-2013) to (28-FEB-2014) respectively, show that the optimal Manning Roughness Coefficient (n) is equal to (0.033) which gives the less error ratio between the observed and calculated water surface elevations. By comparing the results of sediment transport “mass accumulated” for this study which equal to (237.38ton/day) was larger than the value of the previous study which equal to (165ton/day, measured in 2010). But the value of sediment load of this study at Heet station was equal to (551.76 ton/day) which was less than the value of previous study (189.041×〖10〗^3 ton/day, measured in 1988), due to increasing in the rates of discharge that was arrived the reach of study area. الهدف من هذه الدراسة هو حساب نقل الرواسب وتحديد جودة المياه لمقطع من نهر الفرات بطول حوالي (124,4 كم) يبدأ من مؤخر سد حديثة (مقدم الدراسة) وينتهي عند محطة هيت في مدينة هيت (مؤخر الدراسة), حيث انه تم تحديد (196) مقطع عرضي على طول مقطع النهر الذي يمثل منطقة الدراسة باستخدام نموذج (HEC-RAS) الإصدار 4.1، الذي تم تطويره من قبل فيلق مهندسي الجيش الأمريكي للهندسة، ذا بعد واحد، وحسابات التدفق غير مستقرة. تم اجراء عمليتي المعايرة والتحقيق للموديل للفترة من(1– أيلول – 2013 لغاية 30-تشرين الثاني-2013 ) ومن الفترة (1-كانون الاول-2013 لغاية 28-شباط-2014) على التوالي، وعند المعايرة تبين أن أفضل قيمة لمعامل ماننك تساوي (0.033) والتي تعطي أقل نسبة خطأ بين منسوب سطح الماء المقاس ومنسوب سطح الماء المحسوب. أما عند التحقيق فكانت نتائج الحمل الكلي المقاس مسبقاً للدراسة الهيدرولوجية والبايولوجية لنهر الفرات لمشروع محطة كهرباء الانبار الحرارية من قبل المكتب الاستشاري لكلية الهندسة في جامعة الانبار في 2010 والذي يساوي (165 طن/يوم) متوافقة مع الحمل الكلي المحسوب في هذا الموديل والذي يساوي (167.23 طن/اليوم). عند مقارنة نتائج الموديل لهذه الدراسة مع الدراسات السابقة الخاصة بانتقال الرواسب يتبين ان قيمة الحمل الكلي للرواسب في محطة الانبار الحرارية بلغت (237,38 طن/يوم) والتي هي اكبر من قيمة الحمل الكلي لنفس المحطة في 2010 والتي تساوي (165 طن/يوم). أما قيمة الحمل الكلي لمحطة هيت فكان (551,76 طن/يوم) والتي هي أقل من قيمة الدراسة السابقة التي بلغت ( 189000 طن/يوم) والمقاسة في 1988. يعود سبب هذه الفروقات في كميات الحمل الكلي في محطة الانبار الحرارية الى زيادة معدل جريان ماء النهر التي وصلت الى منطقة الدراسة أكثر من المعدلات التي تم التوصل إليها في السنوات السابقة، ويرجع ذلك إلى زيادة معدل السرعة، والعكس بالعكس لمحطة هيت. إن استمرارية حدوث عملية الترسيب تعمل على تغيير واضح لشكل قاع النهر بسبب استمرار حدوث عمليتي التعرية والترسيب لقاع النهر. HEC-RAS model --- sediment transport --- total load --- Euphrates River. The efficiency of adsorption using copper nanocomposite catalysts for the removal of lead ions from aqueous solution was studied. Nano copper and its nanocomposition were prepared in laboratory in very accurate conditions. After preparing samples, the samples were analyzed using XRD and SEM and that shows very good morphology of catalytic performance and has nano sized of crystalline shape. In order to study the efficiency of these catalysts, all samples were tested using adsorption process. The preparing samples show very good efficiency for lead removing from aqueous solution, and reach maximum removal efficiency 96% for 0.05g of adsorbents at pH 10, otherwise increasing or decreasing the pH would give undesirable results for all samples. Langmuir isotherm fitted better than Freundlich isotherm for adsorption of lead.تم دراسة كفاءة الامتزاز باستخدام مركبات النحاس النانوية لإزالة أيونات الرصاص من محلوله المائي. حضرت مركبات النحاس النانوية في المختبر بطرق دقيقة جدا. بعد إعداد العينات، تم تحليل العينات باستخدام حيود الأشعة السينية (XRD) مسح المجهر الإلكتروني (SEM) والتي أظهرت التشكل جيدة جدا وتوزيع متناسق مع شكل نانوي بلوري. من أجل دراسة كفاءة هذه المحفزات، تم اختبار جميع العينات باستخدام عملية الامتزاز. أظهرت العينات المحضرة كفاءة جيدة جدا في ازالة الرصاص من محلوله المائي، وتصل إلى أقصى قدر من الكفاءة إزالة 96٪ لل0.05غم من العوامل المساعدة في درجة الحموضة 10، زيادة درجة الحموضة أو تقليلها من شأنه أعطاء نتائج غير مرغوب فيها لجميع العينات. أعطت معادلة لانكماير (Langmuir) تقارب للنتائج العملة اكثر من معادلة فريندليش (Freundlich) لامتزاز الرصاص. In this research, experimental and analytical deep drawing of the several-stages design mold is produce hexagonal cup and also proved the influence of the thickness of the sheet on the allocation of strain and laminating in curvature of the cup area for all stages of the drawing. Three stages deep drawing mold was designed and constructed to carry out the experimental work required to produce a hexagonal cup of (28.25 mm by 24.5 mm) , (60 mm) high drawn from a circular flat sheet (80 mm diameter), made from low carbon steel (1006–AISI). Analysis program (ANSYS11.0) to perform the finite element method to accomplish the analytical side of the search. Three types of thickness sheet (t_° = 0.5, 0.7,1 mm) with constant radius of curvature of punch equal to (R_p =4) mm, radius of curvature of die equal to (R_d =8 mm) and radius of curvature of wall of die (R_c= 4 mm) were used. From the experimental and analytical results of the three stages of drawing, it has been found that drawing load less than the more advanced stages of drawing operation on the wall of cup, maximum laminating take place at curvature of the cup area with sheet thickness equal to (t_° =0.5 mm) and maximum thickening take place at the at throat cup with sheet thickness equal to (t_° =1 mm), the maximum values of strains (radial, hoop, thickness and effective) take place at throat cup with sheet thickness equal to (t_° =1 mm). في هذا البحث، تم دراسة عملية السحب العميق ولعدة مراحل لتصميم قالب سحب ولثلاث مراحل لانتاج قدح سداسي بابعاد (24.5 mm x 28.25 mm) وبارتفاع (60 mm) من صفيحة معدنية دائرية من حديد منخفض الكربون. طريقة العناصر المحددة تم تنفيذها باستخدام برنامج. (ANSYS11.0) تم استخدام ثلاث أنواع من سمك الصفيحة (mm70, 80, 90 ( مع نصف قطر تقوس القالب الذكر (mm =4 ( ،نصف قطر تقوس القالب الأنثى ( mm =8 ( ،نصف قطر تقوس جدار القالب. (mm = 4 ( بمقارنة النتائج النظرية والعملية للمراحل الثلاثة وجد حدوث انخفاض في قوة السحب مع توالي المراحل المتعاقبة على جدار القدح ، أقصى ترقرق يحدث للسمك في منطقة تقوس القدح مع استخدام سمك صفيحة مساويا ل (mm =0.5 )، أقصى قيم الانفعالات (الانفعال القطري ،المحيطي ،السمك والمكافئ) في منطقة حلق القدح مع استخدام سمك صفيحة مساويا لـ (mm =1 ). several stage deep drawing of hexagonal cup --- strain allocation --- sheet thickness. The paper describes a design and simulation of a Supervisory Control And Data Acquisition (SCADA) system to control oil pipeline and depot plant. The aim of the process is to control oil transportation through a shared pipeline and to minimize products contamination. The study attempts to fulfill an optimal sequence of batches of refined products to satisfy the customer demands in term of: volume , maximum flow rate, optimizing the total operational cost, and reducing products contamination. The proposed system introduces a control algorithm to perform process control system functions and for achieving the tasks and actions in specific sequences and precedence. The control algorithm performs processing of pumping station control, sharing single oil pipeline, maintaining tanks level, and depot inventory control. This paper investigate many factors which effects the length of transmix segment, which enable to offer optimum solutions to reduce products contamination. LabVIEW software is used for performing various signals acquisition and monitoring, also for simulating and designing the control system strategy. بسبب عدم توفر خطوط انابيب نفطية مستقلة لنقل المنتوجات النفطية المختلفة لذلك يستخدم اسلوب المشاركة في استخدام خطوط انابيب النقل واجراء عملية الضخ التعاقبي للمنتوجات عبر الانابيب على شكل دفعات. تهدف الدراسة الى تقليل كمية الخليط والتلوث في المنتوجات النفطية بسبب المشاركة في استخدام خطوط انابيب النقل منتوجات نفطية و تحسين جودة المنتوجات النفطية اضافة الى تامين احتياجات المستهلكين في توقيتات محددة. اعتمدت الدراسة اسلوب الدمج بين خصائص (منظومات السيطرة الرقابية والتحكم والاشراف وجمع البيانات) والنظام (LabVIEW) مما ادى الى اكتساب محاسن هاتين التقنيتين. تضمنت الدراسة تصميم منظومة مقترحة مشابه لمنظومة حقيقية وبناء الموديل الرياضي لها وتنفيذ واختبار المنظومة باسلوب المحاكات واجراء عدد كبير من الاختبارات والتشغيل للمنظومة . يوفر النظام المقترح امكانية التشغيل الالي وتقليل نسبة التلوث بمقدار (3-5) % بالقياس الى النظام اليدوي. The effect of fines content (material finer than 0.075 mm) on the mechanical properties of subbase course aggregate is studied in this paper. a laboratory tests were carried out using percentage of fines material 5%, 10% and 15% by weight adding to the original subbase aggregate class B according to Iraqi specification (SCRB) which the specification limit the range of fines between 5-15%. The repeated load CBR test was done to study the mechanical properties; accumulative permanent, elastic deformation and equivalent elastic modulus. The RL CBR test was useful technique to assess the influence of fines material and stress level on the equivalent elastic modulus, and on the evolution of deformation. The equivalent modulus increase when adding 5% of fines material in case of plastic fines, but in case of non-plastic the increase continues until adding 10% fines material. Adding fines material also led to change in accumulative permanent deformation, where adding 5% fines material increase the permanent deformation by 36%, 5% for material with plastic fines and 20% for material with non-plastic fines for unsoaked samples. In case of soaked samples permanent deformation increase by 28% and 25% at adding fines material for material with plastic fines where decrease by 1% at adding 5% fines to original granular material with non-plastic fines. The theoretical modeling show that the deformation increase by increasing number of loads repetitions. يقدم هذا البحث دراسة لتأثير المحتوى الناعم (المواد الأنعم من 0.075 ملم) على الخصائص الميكانيكية لركام طبقة تحت الأساس . الفحوصات المختبرية نُفذت بأستخدام نسب من المواد الناعمة 5%, 10% و 15% من الوزن مضافة الى ركام تحت الأساس نوع B حسب المواصفة العراقية الذي فيه حدود المواصفة للمواد الناعمة بين ( 5- 15%). تم تنفيذ فحص نسبة التحمل الكاليفورني للأحمال المتكررة لدراسة الخصائص الميكانيكية; التشوه الدائم التراكمي, التشوه المرن ومعامل المرونة المكافيء. فحص نسبة التحمل الكاليفورني للأحمال المتكررة تقنية مفيدة لتقييم تأثير المواد الناعمة ومستوى الاجهاد على معامل المرونة المكافيء وتطور التشوه. معامل المرونة المكافيء يكون في اعلى قيمة عند اضافة 5% من المواد الناعمة في حالة المواد الناعمة اللدنة لكن في حالة المواد عديمة اللدونة الزيادة تستمر حتى عند اضافة 10%من المواد الناعمة. اضافة المواد الناعمة كذلك يؤدي الى تغيير في التشوه الدائم التراكمي حيث اضافة 5% من المواد الناعمة يزيد التشوه الدائم بنسبة 36% و 5% بالنسبة للمواد ذات محتوى ناعم لدن وبنسبة 20% للمواد الحاوية على مواد ناعمة عديمة اللدونة للنماذج غير المغمورة. في حالة النماذج المغمورة التشوه يزيد بنسبة 28% و25% عند اضافة المواد الناعمة اللدنة بينما تقل بنسبة 1% عند اضافة 5% مواد ناعمة الى المواد الاصلية عديمة اللدونة . النمذجة النظرية اظهرت ان التشوه يزداد بإزدياد عدد مرات الحمل. Eight RC circular hollow columns (external diameter = 220 mm, internal diameter = 100 mm, length = 1000 mm and the hollow part = 700mm) casted and strengthened with ferrocement fibers composites to illustrate the behavior of these columns under concentric and eccentric axial compression force. Two columns where used as reference columns, which were repaired after failure to be tested as retrofitted columns. Six specimens were strengthened with one and two WWM layers as required. The variables considered included number of the WWM layers (N), the loading configuration and the eccentricity value (e) of loading. The ferrocement thickness was constant at 20 mm in all retrofitted and strengthened specimens. The test results revealed that the maximum increase in the ultimate concentric loads were 67% by strengthening the reference column with two layers of WWM, and the maximum increase in the ultimate eccentric load of columns was 78% by increasing of the WWM from one to two layers. For a constant number of WWM layers, the change from concentric to eccentric force caused a decrease in the ultimate load value attaining 73.5% for one- layer WWM strengthened columns. The failure of columns occurred by yielding of steel reinforcement followed by concrete crushing (i.e. tension failure). في هذه الدراسة تم صب ثمانية أعمدة خرسانية مسلحة مجوفة دائرية (القطر الخارجي = 220 ملم، القطر الداخلي = 100 ملم، الطول = 1000 ملم و الجزء المجوف = 700 ملم) مقواة بالفيروسمنت المركب ذي الألياف لتوضيح سلوك هذه الأعمدة تحت نظام التحميل المحوري (المركزي) واللامركزي. تم أعتبار عمودين من الأعمدة كأعمدة مرجعية ثم أُعيد تصليحها بعد الفشل لتكون أعمدة معاد تأهيلها. العينات الستة الباقية قويت بطبقة أو طبقتين من شبكات السلك الملحوم كما هو مطلوب. إن المتغيرات التي تم أخذها بنظر الإعتبار شملت عدد شبكات السلك الملحوم، نظام التحميل وكذلك قيمة اللامركزية للتحميل ثنائي المحور. إن سمك الفيروسمنت كان ثابتاً بـ 20 ملم في كل العينات المقواة والمعاد تأهيلها. النتائج المختبرية وضحت بأن أعظم زيادة في الحمل الأقصى للأعمدة المحملة محورياً كانت 67% عند تقوية العمود المرجعي بطبقتين من شبكات السلك الملحوم (SA 0 → SA 2)، كما إن أعظم زيادة في الحمل الأقصى للأعمدة المحملة لا مركزياً كانت 78% عند زيادة شبكات السلك الملحوم من طبقة إلى طبقتين (SE0.6r 1 → SE0.6r 2). عند ثبوت عدد شبكات السلك الملحوم، فإن تغيير نظام التحميل من نظام محوري إلى نظام لا مركزي يسبب نقصان في الحمل الأقصى وإن أعظم نقصان كان 73.5% للأعمدة المقواة بطبقة واحدة من شبكات السلك الملحوم (SA 1 → SE0.6r 1). إن الفشل الحاصل في الأعمدة حدث بخضوع حديد التسليح متبوعاً بوصول الإنفعال في الخرسانة إلى 0.003 وتهشم الخرسانة (بما معناه فشل شد). Hollow Columns --- Ferrocement --- High Strength Concrete --- Strengthening --- and Repair. The aim of this work is to use Fiber Bragg Grating (FBG) to detect the breast cancer at its earliest stages based on the Photoacoustic (PA) hybrid technique. The fiber Bragg gratings sensitivity to acoustic wave, effect of grating length, effect of grating refractive index modification, and ultrasonic frequency on the wavelength sensitivity and intensity sensitivity of the ultrasonic sensor (FBG) for ultrasonic waves were investigated using a simulation programs. A wavelength for the photoacoustic (PA) excitation laser was chosen with respect to a high absorption by the tumor and with low absorption to the surrounding tissue (normal tissue); for higher contrast absorption between them. Fiber Bragg can be used as a sensor to detect the acoustic wave emitted from the tumor (depending on the photoacoustic principle). In this study, k-wave a MATLAB toolbox was used to simulate photoacoustic wave which is detected with fiber Bragg grating simulation, using Optisystem program. The acoustic wave was transferred to FBG by using Optisystem-MTLAB communication programs to detect tumors. الهدف من هذا العمل هو استخدام الياف الترشيح الضوئي مستقبلا للكشف عن سرطان الثدي في مراحله المبكرة على اساس استخدام التقنية الضوئي-الصوتي الهجينة. لقد تم التحقق من تحسس الياف الترشيح الضوئي وتأثير طول المرشح وتأثير تعديل معامل الانكسار وتأثير الموجات فوق الصوتية على متحسس الموجات (الياف الترشيح الضوئي) على حساسية الطول الموجي والشدة ،باستخدام برامج المحاكات. حيث تم اختيار محفز الليزر في العملية الضوئي-الصوتي بأعلى تباين بين المنطقتين ،على ان يكون اعلى امتصاص له في منطقة الورم (ان وجد) واقل امتصاص في المنطقة المحيطة (النسيج الطبيعي). ان الياف الترشيح الضوئي يمكن استخدامها مستقبلا كأجهزة استشعار للموجات المبعوثة من الورم بشكل تطبيقي (اعتماد على المبدأ الضوئي- الصوتي). في هذه الدراسة تم استخدام أدوات الكي- ويف (k-wave) لبرنامج المحاكاة المات لاب (Matlab) لمحاكاة الموجة الضوئية-الصوتية والتي تم الكشف عنها باستخدام الياف الترشيح الضوئي باستخدام برنامج المحاكاة الاوبتي سستم(Optisystem)، وقد تم نقل هذه الموجات الى الياف الترشيح الضوئي باستخدام برامج الاتصال بين المات لاب والاوبتي سستم (Optisystem). Fiber Bragg grating (FBG) --- lasers --- Matlab Optisystem communication programs --- Photoacoustic detection --- and Pressure wave. Field compaction equipment used for fine grained soil usually applies a kneading action or vibration that produces shear forces which also reshape soil particles arrangement. A state that might not be completely simulated by laboratory Proctor tests. This study aims at investigating the significance of using the newer modified Texas superpave gyratory compactor (SGC) to simulate field compaction of fine grained soil due to its ability to apply loads in different angles generating shear forces on the compacted soil specimens. Two types of soil (A-4) and (A-7-6) were compacted using standard Proctor, modified Proctor and (SGC). The results were compared to dry field densities of the same soil in order to evaluate the most representative test. It was found that maximum dry densities of soil type (A-4) obtained using (SGC) under (200 kPa) and (600 kPa) were lower by (2.07%) and higher by (1.35%) than the maximum dry densities obtained using standard and modified Proctor tests respectively. It was also found that maximum dry densities of soil type (A-7-6) obtained using (SGC) under (300 kPa) and (600 kPa) were lower by (1.02%) and higher by (1.23%) than the maximum dry densities obtained using standard and modified Proctor tests respectively. The aforementioned confinement pressure values were applied in order to achieve dry densities similar to that obtained by Proctor tests. When comparing laboratory results to dry filed densities, it was found that (SGC) test results were slightly closer to them than Proctor tests results. Nevertheless, the difference between (SGC) and Proctor tests results seems to be insignificant for these types of soil compared to the higher effort needed to perform (SGC) tests.إن معدات الرص الحقلي التي تستعمل لرص الترب ناعمة الحبيبات عادة ما تحدث عملية عجن أو اهتزاز لحبيبات التربة مسببة قوى قص من شأنها أعادة تنظيم حبيبات التربة. الأمر الذي قد لا يمكن محاكاته بشكل تام عند استعمال فحصي بروكتر مختبرياً. تهدف هذه الدراسة الى بحث جدوى استعمال جهاز تكساس الحديث المعدل للرص الدوار (SGC) لمحاكاة الرص الحقلي للتربة ناعمة الحبيبات لما له من قدرة على تسليط الأحمال بزوايا مختلفة مما يسلط قوى قص على عينات التربة عند رصها. وقد تم استعمال نوعين من الترب الناعمة نوع (A-4) ونوع (A-7-6) لإجراء فحص الرص المختبري باستعمال ثلاثة طرق هي بروكتر القياسي وبروكتر المعدل وجهاز الرص الدوار. ثم تم مقارنة النتائج مع نتائج الفحوصات الحقلية. لقد وجد ان الكثافة الجافة العظمى للتربة من نوع (A-4) التي تم الحصول عليها باستعمال (SGC) تحت ضغط (200 كيلو باسكال) تقل بنسبة (2.07٪) عن الكثافة الجافة العظمى التي تم الحصول عليها باستعمال فحص بروكتر القياسي، وتزيد تحت ضغط (600 كيلو باسكال) بنسبة (1.35٪) عن الكثافة الجافة العظمى التي تم الحصول عليها باستعمال فحص بروكتر المعدل. كما وجد أن الكثافة الجافة العظمى للتربة من نوع (A-7-6) التي تم الحصول عليها باستعمال (SGC) تحت ضغط (300 كيلو باسكال) تقل بنسبة (1.02٪) عن الكثافة الجافة العظمى باستعمال فحص بروكتر القياسي وتزيد تحت ضغط (600 كيلو باسكال) بنسبة (1.23٪) عن الكثافة الجافة العظمى المستحصلة باستعمال فحص بروكتر المعدل لنفس النوع من التربة. وقد تم تعيين قيم الضغط المذكورة آنفاً بحيث تحقق كثافة جافة مساوية لما هي عليه في فحصي بروكتر. وعند مقارنة النتائج المختبرية مع الكثافة الجافة الحقلية وجد ان نتائج (SGC) اقرب اليها قليلاً من نتائج فحوصات بروكتر. ومع ذلك فإن الفرق بين فحص الرص الدوار وفحصي بروكتر يبدو غير ذي جدوى لهذين النوعين من التربة قياساً بالجهد الأعلى المطلوب لاجراء الفحص الدوار. Field soil compaction --- Laboratory soil compaction --- Superpave gyratory compactor --- Standard and Modified Proctor tests. Box-Wilson experimental design method was employed to optimize bioethanol production from low grade, unclassified, waste Iraqi dates. The optimization process was based on four independent relevant parameters-initial sugar concentration (50-100 g/l), pH (4.5-6.5), fermentation time (48-96 hrs), and temperature (25-35℃). A maximum bioethanol yield of 33.9 g/l was practically achieved following thirty different experimental runs, as specified by 24-Central Composite Design (CCD). The optimum values for the aforementioned four parameters, corresponding to the maximum yield, were: 75g/l, pH 5.5, 72 hrs, 30℃, respectively. The obtained experimental data were utilized to develop a semi-empirical model, based on a second-degree polynomial, to predict bioethanol yield. The model was tested using ANOVA software (Design expert® 9) and found acceptable (R2=0.9025). Yield response surface and contour plots were created using the developed model, which revealed the presence of high-yield plateaus whose specifications will be useful in controlling pilot-or industrial scale future units to ensure economical feasibility. طريقة بوكس ولسن لتصميم التجارب استخدمت لايجاد الظروف المثلى لانتاج الايثانول الحيوي من التمور العراقية رديئة النوعية الغير مصنفة ( تعتبر نفايات). عملية الاختيار الامثل لاربع متغيرات –التركيز الابتدائي للسكر(50-100 غم/لتر)، الدالة الحامضية (4.5-6.5)، زمن التخمير(48-96 ساعة)، ودرجة الحرارة(25-35 مئوية). اقصى انتاج للايثانول الحيوي 33.9 غم/لتر تم الحصول علية من خلال ثلاثون تجربة مختبرية، المعرفة ب 24 التصميم الدوار المركب المركزي (CCD). القيم المثلى للمتغيرات المذكورة أعلاه، اعتمادا على اقصى انتاجية: 75 غم/لتر، الدالة الحامضية 5.5، 72 ساعة، 30 درجة مئوية على التوالي. البيانات التجريبية الت تم الحصول عليها استخدمت لتطوير نموذج تطبيقي، معادلة متعددة الحدود من الدرجة الثانية للمتغيرات الاربعة، للتنبؤ بانتاجية الايثانول الحيوي. هذا النموذج تم اختبارة باستخدام تحليل التباين (ANOVA) وباستخدام Design expert® 9 software ووجد انه مقبول ب(R2=0.9025). الاستجابة السطحية والاشكال الكنتورية التي تم الحصول عليها باستخدام النموذج، والتي تبين اعلى انتاجية بالهضبة الموجودة والتي يمكن الاستفادة منها واستخدامها للسيطرة على المنظومات الريادية والوحدات الصناعية المصنعة لاحقا ولضمان الجدوى الاقتصادية. optimization --- bioethanol --- Low grade Iraqi Dates --- Response surface Methodology --- ANOVA --- Design expert® 9 software. Mathematical and numerical study of finned tube air cooled condenser for air conditioning unit with two ton refrigeration capacity using R22 as a base fluid and R407C an alternative fluid was investigated. Different parameters were considered in this work, such as condensing pressure, ambient temperature and refrigerant mass flow. A comparison of performance between two condensers when using R22 and R407C were performed. A redesign the condenser operates with the R407C to operate with the same system that operates with R22. The result showed the same behavior for the two refrigerants, the condensers are possible to work with R407C for the same geometry and some modifications in the structure of heat exchange with the same air velocity. The proposed model was validated with the outputs from the test data given in literature papers, derived from air cooled condensers with different dimensions. The results exhibited an agreement with the experimental results with a percentage of compatibility ± 10%. تم في هذا البحث دراسة عددية ورياضية لاداء مكثف ذو انابيب مزعنفة في وحدة تكييف هواء سعة اثنين طن تبريد تعمل بمائع التثليج R22 كمائع اساسي وR407C كمائع بديل. تمت دراست عدة متغيرات كضغط المكثف, ودرجة حرارة المحيط, ومعدل تدفق الكتلة لمائعي التثليج. عند مقارنة اداء المكثف عندما يعمل بمائعي التثليج R407C و R22 وجد انه يجب اعادة تصميم المكثف ليلائم العمل مع المائع R407C مع الابقاء على نفس اجزاء المنظومة الاخرى. اظهرت النتائج تشابه في سلوك مائعي التثليج لذا يمكن ان يعمل المكثف بمائع التثليج R407C بنفس الوحدة مع بعض التحسينات في تركيب المبادل الحراري ولنفس سرعة الهواء. تم مطابقة نتائج الانموذج المقترح مع النتائج العملية المنشورة في البحوث ولابعاد مختلفة , ووجد ان نسبة التوافق مع النتائج العملية لكمية الحرارة المطروحة في المكثف هي بحدود 10 % ± . air cooled condenser --- R22 --- R407C --- numerical --- alternative refrigerant. Determination of Mass Transfer Coefficient for Copper Electrodeposition by Limiting Current Technique. Mass transfer coefficient --- Electrodeposion of copper --- Rotating cylinder electrode (RCE) --- Cupric ion removal --- Limiting current technique (LCT). The ability of fungal waste biomass type White Agaricus Bisporus to biosorb Pb(II) ,Cr(III), Cd(II) and Co(II) from wastewater was investigated in batch process. Single and binary mixtures were used at low metal concentration wastewater treatment. The size of the biosorbent ranged 0.3-1 mm. The biosorption capacity of the biosorbent was evaluated under equilibrium conditions at 25 °C. Results indicated that the biosorption capacity of waste of fungi for the binary mixture was always lower than that for a single component system. Eight isotherm models were used to fit the experimental data of single system and Langmuir model was found a suitable to describe the biosorption data. The maximum uptake capacity (qe) of Pb(II), Cr(III), Cd(II) and Co(II) in single system was 158.73, 46.94, 40.16 and15.94 mg/g respectively with correlation coefficients 0.999,0.998,0.988 and 0.991 respectively. For binary system, four biosorption models were used to fit the experimental data. Extended Langmuir model gave the best fitting. The removal percentage of heavy metals onto fungal waste biomass was in order of Pb(II) > Cr(III) > Cd(II) > Co(II) in both single and binary system. The results show that the using waste of fungi as a biosorbent of heavy metals gave a higher uptake capacity of four heavy metals.تمت دراسة قدرة عملية الامتزاز الحيوي لمخلفات الفطر نوع (White Agaricus Bisporus) لامتزاز ايونات الرصاص ,الكروم,الكادميوم,والكوبلت من المياه الملوثه عن طريق تجارب الدفعات (Batch experiments) وبقطر للمادة المازه 0.3-1 ملم وبدرجة حرارة 25 مئوية . لقد بينت النتائج ان الامتزازالحيوي الثنائي اقل من المفرد. تم القيام بسلسلة من تجارب الدفعات للملوثات بصورة منفردة واستخدام ثمانية موديلات رياضية التي تصف عملية الامتزاز الحيوي , وجد ان موديل ( Langmuir) افضل موديل رياضي يمثل النتائج العملية وان سعة الامتزاز الحيوي للكوبلت,الكادميوم , الكروم والرصاص هي 158.74,46.94,40.16,15.94 ملغم/غم بمعامل (correlation coefficients) 0.999,0.998,0.998,0.991 على التوالي اما بالنسبة للنظام الثنائي اربع موديلات اعتمدت ووجد ان (Extended Langmuir model)افضل موديل يمثل النتائج العملية.ان نسبة الازاله للعناصر الثقيله في النظام المفرد والثنائي كالاتي: Pb(II) > Cr(III) > Cd(II) > Co(II).لقد اظهرت النتائج ان سعة الامتزاز عالية لجميع ايونات العناصر الثقيلة على مخلفات الفطر. DC servo motor is simple in construction and control and has many applications. However, the uncertainties due to its parameters changes such as load torque and friction are an evitable. Therefore, a robust controller has to be employed for keeping specified requirements irrespective to parameter variations. In the present work, two sliding mode controllers have been suggested to control the speed of DC motor under motor load changes; classical and integral sliding mode controllers. The integral slide mode control could show better tracking characteristics than its counterpart and also could compensate the change in system parameters.يتميز المحرك المؤازر يسهولة التركيب والسيطرة وله تطبيقات عديدة. مع ذلك، فان هناك حتمية في ظهور او وجود ((Uncertainties بسبب تغير معلماته. لذلك يتوجب استخدام مسيطر متين للحفاظ على المتتطلبات المحددة والموصوفة للمنظومة بغض النظر عن تغير تلك المعلمات. في هذا البحث تم اقتراح مسيطرين ذات النمط الانزلاقي لغرض السيطرة على سرعة المحرك ذو التيار المستمر تحت تاثير احمال مختلفة وهما: المسيطر التقليدي ذات النمط الانزلاقي وكذلك المسيطر التكاملي ذات النمط الانزلاقي. اظهرت النتائج بان المسيطر التماملي ذات النمط الانزلاقي اعطى اداء اعلى وخصائص متابعة افضل من المسيطر التقليدي وتمكن من اجراء التعويض الناتج من تغير الحاصل في متغيرات المنظمومة بشكل افضل من نظيره. This paper presents an investigation to the performance of quantized direct-sequence spread spectrum system (DSSS) in mobile wireless communications systems. To obtain a real world value (RWV), the DSSS received signal is quantized to different levels of fixed-point values. These modes of quantization are evaluated by calculating BER under different channels environments (AWGN, Rayleigh, and Rician multipath fading). The effect of range of the represented values, the number precision and increasing in quantization noise on the performance of quantized DS in mobile wireless communications is also investigated. Based on simulation results, it is observed that quantized direct-sequence offers a trade-off between complexity and noise rejection compared to non-quantized DSSS and making a good representation of the digitized signals to implement the required DSSS in mobile wireless communications.يقدم هذا البحث تحقيقا لأداء نظام الطيف المنتشر-السلسلة المباشرة (DSSS) في الاتصالات المتنقلة. للحصول على القيمة الحقيقية، تم أجراء عملية التكميم على أشاره الطيف المنتشر بمستويات مختلفة من تمثيل النقطة الثابتة. وتم تقييم هذه الأوضاع من التكميم عن طريق حساب BER تحت بيئة قنوات مختلفة (AWGN، Rayleigh، Rician). وبناء على نتائج المحاكاة، لوحظ أن نظام السلسلة المباشرة الكمية توفر أداء وسط بين التركيب المادي للنظام ورفض الضجيج مقارنة مع نظام السلسلة المباشرة الغير كمية وجعل التمثيل ملائم للإشارات الرقمية لتنفيذ DSSS المطلوب في مجال الاتصالات اللاسلكية المتنقلة. mobile wireless communications --- spread spectrum systems --- direct-sequence --- multipath fading --- quantization --- fixed-point conversion. Authors: Rafal Taha Abdulhussein --- Muhammad A.M. The effect of defect on structures and machines has negative consequences on them and it always takes researchers concern and attention in order to find feasible solutions to trace and detect the location of the defect accurately. In this research, the effect of a hole with different diameters on a square composite plate is studied as well as the effects of both the boundary condition and the plate thickness, furthermore, Vibration analysis of composite plate has been studied numerically and experimentally. The Numerical analysis has been carried out by using FEM by building MATLAB program as well as (ANSYS 15). The experimental part of this research is done by using vibration measuring instruments. The rate of error among the experimental tests and the numerical solution is less than 15%. These results have been used an inputs to the Genetic Algorithm model that the defect is located by, with a high percentage of success. طالما كان تاثير العيوب سلبيا على الهياكل والالات لذلك فقد شغل هذا الموضوع اهتمام الباحثين وبات من الضروري ايجاد حلول ناجعة للكشف عن مواقع تلك العيوب. في هذا البحث تمت دراسة تاثير ثقب متغير الحجم على صفيحة مركبة مربعة الشكل بضروف تثبيت مختلفة واسماك مختلفة حيث تم حساب الترددات الطبيعية للصفيحة عمليا ونظريا, الجانب النظري تم بواسطة التحليل العددي عن طريق برنامج (MATLAB 14) وبرنامج (ANSYS mechanical APDL 15) وتمت مقارنة نتائج كلى الجانبين العملي والنظري مع بعضهما واظهرت النتائج توافقا كبيرا اما الجانب العملي من هذا البحث تم باستخدام معدات قياس الاهتزازوكان معدل الخطا بين الجانبين العملي والنظري اقل من 15%. وقد استخدمت تلك النتائج كمدخللات للخوارزمية الجينية التي تم عن طريقها تحديد موقع الثقب بنسبة نجاح عالية. Friction Stir welding (FSW) parameters, which play a vital principle, that impact on the mechanical, microstructural properties of the weldment because of the warmth produced by the contact between the instrument and work-piece, An AA6061-T6 aluminum composite plate with measurements (186*150*4) mm3 welded through various rotational paces 800, 1000, 1200 and 1450 rpm, the created heat measured through thermocouples embedded in study zones of the Weldment, a Finite Element model have been executed by utilizing ANSYS 12.1 bundle charges to ponder the temperature appropriation amid stay stage, the outcomes demonstrates a decent assention between the after effects of exploratory and hypothetical tests. The most extreme temperature measured at this condition was 0.71 from the liquefying temperature of the sample at a maximum rotational speed of (1450) r/min.في هذا البحث تم دراسة تاثير طريقة لحام الخلط الاحتكاكي (FSW), و طريقة اللحام هذه تعمل كدور اساسي في تاثيرها على الخواص الميكانيكية والتركيب البلوري للعينة المستخدمة, بسبب الحرارة المتولدة نتيجة الاتصال بين العينة والصفيحة. العينة كانت عبارة عن صفـيحة من سـبـيـكة الألمنيوم AA6061-T6)) وكانت قيـاساتها المختـبرية ( 186* 150* 4) ملم3 وتمت عملية اللحام باربعة قيم لسرع دورانية هي (1450,1200,1000,800) دورة/دقيقة. وكمية درجة الحرارة الناتجة من اللحام الدوراني والتي كانت هي اساس هذا البحث تم قياسها بواسطة مزدوج حراري مغروس داخل الصفيحة وموصل الى قاريء الكتروني, وتم استخدام موديل للعناصر المحددة(ANSYS 12.1) للتوزيع الحراري لفهم الظواهر التي تقع خلال طور التغلغل لاداة اللحام في لحام الخلط الاحتكاكي. وكانت النتائج النظرية قد وضحت موافقة جيدة مع النتائج العملية المقاسة لدرجة الحرارة بواسطة المزدوج الحراري. وبينت النتائج ان اقصى درجة حرارة تم الوصول اليها هي (0,71) من درجة الانصهار للعينة عند اقصى سرعة دورانية وهي (1450) دورة/دقيقة. Porosity is one of the most important reservoir characteristics because it indicates to fluid collection. Several techniques used to get good porosity prediction, so, in this study we employed seismic attributes and well log data in a genetic algorithm to get the best porosity prediction. The study attempt to enhance the performance of genetic algorithm for attribute selection and therefore porosity prediction by applying genetic algorithm on different types of fitness functions like average mean square error fitness, average correlation coefficients fitness and performance index fitness. Also, used two methods to represent attributes in genetic algorithm. Different witnesses applied to choose the appropriate fitness function that gives high porosity prediction. المسامية هي واحد من اهم خواص الخزان النفطي لانها تعطي استدلال عن تجمع السوائل. هناك عدة تقنيات تستخدم للحصول على تنبؤ جيد للمسامية، في هذه الدراسه تم توظيف الخواص الزلزالية الصناعية ومعلومات تسجيلات الابار في الخوارزمية الوراثية للحصول على افضل تنبؤ للمسامية. في هذه الدراسة نحاول تحسين اداء الخوارزمية الوراثية لاختيار الخواص وبالتالي اعطاء تنبؤ جيد للمسامية عن طريق تطبيق عدة انواع من دوال الهدف مثل average mean square error, average correlation coefficients, performance index وكذلك استخدام طريقتين لتمثيل الخواص داخل الخوارزمية الوراثية، عدة معايير تطبق لاختيار دالة الهدف المناسبة التي تعطي تنبؤ عال للمسامية. The adsorptions of copper ions from aqueous solution by can papyrus were studied using batch and continuous adsorption. It has been improved surface area and efficiency of the cane papyrus using urea and thiurea at different concentrations through stirring in period of time with mixer. Results proved that cane papyrus very well in the adsorption of metal through the study of important variables and influences such as the contact time, pH in addition to the initial concentration. It was found that the effect of pH at 6 to 7 better than acid or base solution also found that the best time for adsorption to reach equilibrium is 90min and there is no effect of temperature significantly on the results observed, studied the effect of weight of the cane where found that 0.4g best weight. After treatment with urea and thiurea the results improved from the 56% removal by natural cane, 61% for urea modified and 68% for thiurea modified. For continuous adsorption the results shows that when the flow rate increase in constant bed of adsorbent the breakthrough decrease. As well as the best curve was obtained using a cane modified with thiurea weighing 2.5g in a continuous flow rate where the breakthrough curve is start from 25min to 175min. The results was applied to Langmuir and Freundlich adsorption isotherms, the results fitted will to both at correlation coefficients 0.971 and 0.9066 for Langmiur and Freundlich respectively. Pseudo second order was applied and gives better results for adsorption where R2 is 0.9941 while for pseudo first order R2 is 0.136. تم دراسة امتزاز أيون النحاس من المحاليل المائية باستخدام طريقة الامتزاز الساكن والمستمر بوجود عامل ماز طبيعي هو قصب البردي. تم تحسين المساحة السطحية والكفاءة لقصب البردي باستخدام مادة اليوريا والثايوريا بتراكيز مختلفة من خلال نقعها لمدة زمنية محددة مع الخلط. اثبتت النتائج ان قصب البردي جيد جدا في امتزاز المعادن وذلك من خلال دراسة المتغيرات والتأثيرات المهمة مثل الوقت والاس الهايدروجيني بالاضافة الى التركيز الاولى للنحاس في محلولهه الماءي. حيث وجد ان تاثير الاس الهايدروجيني عند 6 الى 7 افضل من الحامضي او القاعدي كما وجد ان افضل وقت للامتزاز للوصول الى الاستقرار هو 90دقيقة كما ولوحظ عدم تاثير درجة الحرارة بشكل ملحوظ على النتائج, تم دراسة تاثير وزن القصب حيث وجد ان 0.4غم افضل وزن, كل هذه الظروف درست للقصب بحالته الطبيعية قبل المعاملة اما بعد المعاملة باليوريا والثايوريا اثبتت تحسن بالنتائج من 56% نسبة الازالة للقصب ثم 61% للمعامل باليوريا و68% للمعامل بالثايوريا. اما في حالة التجارب المستمرة فان النتائج بينت من خلال الرسومات ان نسبة الزيادة بالسرعة تؤدي الى انخفاض الكفاءة كذلك بالنسبة لزيادة التركيز بثبات وزن القصب يؤدي الى انخفاض الكفاءة. كذلك افضل منحنى تم الحصول عليه باستخدام قصب معامل بالثايوريا بوزن 2.5غم في معدل جريان مستمر حيث وجد ان منحنى الكفاءة ينحصر بوقت من 25دقيقة الى 175 دقيقة. تم تطبيق النتائج العملية على معادلات لانكماير وفرندليش واعطو تطابق للنتائج بمعدل تصحيح 0.971 للانكماير و0.9066 لفريندلش بالاضافة الى ان النتائج اظهرت تقاربا لمعادلة تفاعل من الدرجة الثانية بمعدل تصحيح 0.9941 بينما اعطت 0.136 لمعادلة من الدرجة الاولى. The present work is a numerical study of thermal performance of modified flat plate solar water collectors. Numerical simulations have been done by solving the governing equations (Continuity, Momentum and Energy) equations in the laminar regime , three dimensions by using the FLUENT software version (14.5). The effect of flow on temperature distribution of flat plate water collectors by inserting (twist strip with twist ratio (3), helical spring surrounding the solid shaft) inside riser pipes is numerically simulated and compared with solar collector without inserting device inside its riser pipes at flow rates of (100)ℓ/h . The numerical simulation results show that the flat plate water, solar collectors with the inserted, twist strip and helical spring that’s surround the solid shaft were higher enhancement of heat transfer than without inserted devices. The useful energy in case of twist strip is (10%) higher than the case of flat plate solar collector without enhancement device. Also, the case of helical spring is increased (6.8 %) than the twist strip, and (16.2%) than collector without enhancement device for the same mass flow rate. يوضح البحث الحالي دراسة عددية لتحسين الاداء الحراري لمجمعات الماء الشمسية المسطحة. تمت الدراسة العددية بحل المعادلات الحاكمة (الاستمرارية ، الزخم والطاقة) لجريان طباقي ثلاثي الابعاد باستخدام برنامج (Fluent 14.5 ) . تضمن الحل العددي دراسة تاثير الجريان وتوزيع درجات الحرارة لمجمعات الماء الشمسية من خلال اقحام ادوات (شريط ملتوي ذات نسبة التواء (3) ، محور صلب محاط بنابض حلزوني ) داخل انابيب رفع الماء ومقارنتها مع مجمع شمسي بدون اقحام ادوات داخل انابيب رفع الماء عند معدل تدفق (100) لتر/ ساعة. اظهرت النتائج العددية ان اقحام شريط ملتوي ذات نسبة الالتواء (3) ومحور صلب محاط بنابض حلزوني داخل انابيب رفع الماء تؤدي الى تحسين انتقال الحرارة بشكل ملحوض عن الحالة بدون اقحام هذه الادوات . ان الطاقة المفيدة في حالة الشريط الملتوي اعلى بمقدار ((10% في حالة المجمع الشمسي بدون ادوات اقحام . كذلك في حالة اقحام محور صلب محاط بنابض حلزوني بلغت الزيادة في مقدار الطاقة المفيدة 6.8 %)) عن حالة الشريط الملتوي و 16.2% )) عن حالة المجمع الشمسي بدون ادوات اقحام عند نفس معدل التدفق. The optimal spacing between elliptic tubes cooled by free convection is studied numerically. A row of isothermal elliptic tubes are installed in a fixed volume and the spacing between them is selected according to the constructal theory (Bejan's theory). In this theory the spacing between the tubes is chosen such that the heat transfer density is maximized. A finite volume method is employed to solve the governing equations; SIMPLE algorithm with collocated grid is utilized for coupling between velocity and pressure. The range of Rayleigh number is (103 ≤ Ra ≤ 105), the range of the axis ratio of the tubes is (0 ≤  ≤ 0.5), and the working fluid is air (Pr =0.71). The results show that the optimal spacing decreases as Rayleigh number increases for all axis ratios, and the maximum density of heat transfer increases as the Raleigh number increases for all axis ratios and the highest value occurs at axis ratio ( =0) (flat plate) while the lowest value occurs at ( =0.5) (circular tube). The results also show that the optimal spacing is unchanged with the axis ratio at constant Rayleigh number.البعد الامثل بين انابيب بيضوية مبردة بالحمل الطبيعي درس عدديا. صف من الانابيب البيضوية ثابتة درجة الحرارة نصبت في حجم محدد والبعد بينهم اختير بموجب نظرية التشييد (نظرية بيجان). في هذة النظرية البعد اختير بيحث تكون كثافة انتقال الحرارة اقصى ما يمكن. طريقة الحجم المحدد استخدمت لحل المعادلات الحاكمة, خوارزمية SIMPLE مع شبكة متحدة الموقع استخدمت للربط بين السرعة والضغط. مدى رقم رايلي (103 ≤ Ra ≤ 105) ومدى نسبة الاحداثي للانابيب (0 ≤  ≤ 0.5) ومائع التشغيل هو الهواء (Pr=0.7). بينت النتائج ان البعد الامثل يقل مع زيادة رقم رايلي لكل نسب الاحداثيات وكثافة انتقال الحرارة العظمى تزداد مع زيادة رقم رايلي لكل نسب الاحداثي وقيمتها العليا تحدث عند نسبة احداثي , =0),صفيحة مستوية) وقيمتها السفلى تحدث عند نسبة احداثي , =0.5) انبوب دائري).بينت النتائج ايضا ان البعد الامثل لا يتغير مع نسبة الاحداثي عند رقم رايلي ثابت. The modern development in prosthetics field demand the evaluation of the dynamical behavior and automatic control .The key process in the design and implement of these devices is the determination of the model parameters inherited with the transfer function .In such complicated structures it is so difficult to evaluate transfer function analytically ,however experimental approaches can serve as a simple and effective tool for estimating transfer function and model parameters .In this regard computer software such as Matlab is used .System Identification SID refers to the method for estimating the system transfer function from experimental tests by using computer .In the present paper; SID method is employed for analyzing below-knee prosthesis leg .In order to simulate with the practical requirement for design and evaluation ,two phases of human gait are considered ,namely; swing phase and single support of stance phase .The validity of this method is firstly checked by applying it on clamped-clamped beam model where the required parameters are evaluated and compared theoretically (via modal analysis) and experimentally (via System identification) .It is found that ; the error in estimating the transfer function parameter of beam is not exceeded 6% . Then the transfer function of the prosthesis are estimated for two phases of gait cycle .It is found that; the estimated transfer function of the prosthesis leg is highly affected by the phase type of gait cycle , where ;the natural frequency highly increases, the static gain decrease for support phase as compared with the swing phase ,however the damping ratio does not affected .التطويرات الحديثة في مجال الأطراف الصناعية تتطلب تقييم السلوك الديناميكي و عمليات السيطرة.الذاتية , ان اهم عملية في تصميم وتنفيذ هذه الأجهزة هو تحديد معالم النموذج المرتبطة مع دالة الخصائصTF .في مثل هذه الاجسام المعقدة من الصعب جدا ايجاد دالة الخصائص بطريقة تحليليه، ولكن النهج التجريبية يمكن أن توفر أداة بسيطة وفعالة لتقديرهما عبر استخدام تقنية تعريف الموديل .في هذا المجال يتم استخدام برنامج الكمبيوتر مثل برنامج الماتلاب. في هذا البحث تم توضيف الطريقة لتحليل طرف صناعي تحت الركبة. ومن أجل المحاكاة مع المتطلبات العملية تم اختيار مرحلتين من مشية الإنسان، وهما طور التارجح وطور الاسناد. تم في البداية عمل فحص لهذه الطريقه من خلال تطبيقها على عتبة محكمة الاسناد لايجاد الخصائص المطلوبة ومقارنتها من الناحية النظرية (عبر تحليل الاطوار) وتجريبيا (عن طريق تحديد نموذج) حيث تبين ان نسبة الخطأ لا تتعدى6% لحالة العتبة ,ومن ثم تم تطبيق الطريقة التجريبية على الطرف الصناعي ولطورين من دورة المشي. حيث وجد ان الدوال المخمنة للطرف الصناعي تتاثر بشدة بنوع طور المشية حيث ان التردد الطبيعي يزداد بشدة والربح يقل لحالة طور التارجح بالمقارنة مع طور الاسناد في حين ان نسبة التخميد لم تتاثر. In this research, practical and analytical deep drawing of the several-stages design mold is produce hexagonal cup and also proved the influence of the thickness of the plate on the allocation of strain and laminating in curvature of the cup area for all stages of the drawing. Three stages deep drawing mold was designed and constructed to carry out the practical work required to produce a hexagonal cup of (28.25 mm by 24.5 mm) , (60 mm) high drawn from a circular flat plate (80 mm diameter), made from low carbon steel (1006–AISI). Analysis program (ANSYS11.0) to perform the finite element method to accomplish the analytical side of the search. Three types of thickness plate ( = 0.5, 0.7,1 mm) with constant radius of curvature of punch equal to ( =4) mm, radius of curvature of die equal to ( =8 mm) and radius of curvature of wall of die ( =4 mm) were used. From the practical and analytical results of the three stages of drawing, it has been found that drawing load less than the more advanced stages of drawing operation on the wall of cup, maximum laminating take place at curvature of the cup area with plate thickness equal to ( =0.5 mm) and maximum thickening take place at the at throat cup with plate thickness equal to ( =1 mm), the maximum values of strains (radial, hoop, thickness and effective) take place at throat cup with plate thickness equal to ( =1 mm) في هذا البحث، تم دراسة عملية السحب العميق ولعدة مراحل لتصميم قالب سحب ولثلاث مراحل لانتاج قدح سداسي بابعاد (mm 24.5 28.25 by mm ) وبالاتفاع (mm60 ) من صفيحة معدنية دائرية من حديد منخفض الكاربون. طريقة العناصر المحددة تم تنفيذها باستخدام برنامج. (ANSYS11.0) تم استخدام ثلاث انواع من سمك الصفيحة (70, 80, 90 mm) مع نصف قطر تقوس القالب الذكر ( =4 mm) ، نصف قطر تقوس القالب الانثى ( =8 mm) ، نصف قطر تقوس جدار القالب . ( = 4 mm) بقارنة نتائح النظرية والعملية للمراحل الثلاثة وجد حدوث انخفاض في قوة السحب مع توالي المراحل) المتعاقبة على جدار القدح ، اقصى ترقرق يحدث للسمك في منطقة تقوس القدح مع استخدام سمك صفيحة مساويا ل ( =0.5 mm) ، اقصى قيم الانفغالات (الانفعال القطري ،المحيطي ،السمك والمكافئ) في منطقة حلق القدح مع استخدام سمك صفيحة مساويا ل (=1 mm). several stage deep drawing of hexagonal cup --- strain allocation --- plate thickness.